Take every opportunity to lie on your front if you work at a desk. Go to the park at lunchtime and lie with legs hip-width apart. Bend your arms and rest your forehead on your hands. If you can, let your heels flop inward. Consciously release tension in the lower back. Imagine the pelvic area becoming warm, heavy, and sinking into soft sand, aches and pains dissolving. Feel your breath in your belly, pressing against the support of the ground. To release tension in the neck, shoulders and lower back, sit tall with feet flat on the floor, arms dangling from the shoulder joints. Exhaling, let the weight of your head bring your chin toward your chest. Keep rolling down extremely slowly, allowing your shoulders to droop forward. Come to rest with eyes on knees, arms hanging heavily, palms on the floor. Roll up very slowly on inhalations. Lie on your back, legs hip-width apart, knees bent, feet flat on the floor, arms by your side. Lift your toes, splay, then replace. Inhaling, imagine breathing into the back of your pelvis. Feel everything soften. Exhale and relax your pelvis toward the floor. Inhaling, feel your upper back widen and soften. Exhaling, let your shoulder blades melt into the floor. Lengthen the back of the neck. Feel your head, pelvis and feet supported by the floor. 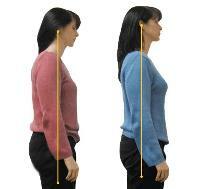 The sides of the torso rarely lengthen in everyday activities yet need to do so to maintain good posture. Sit tall on a supportive chair, feet flat on the floor, tailbone weighted heavily on the chair. Exhaling, draw your abdominal muscles toward your lower back. Inhaling, slowly lengthen your left side, growing out of the pelvis and into your underarm. Let your right arm and shoulder drop toward the floor. When you feel your lower back engage stop. Inhaling, come back to center and repeat on the other side. To slow loss of spinal mobility with age, rotate the spine daily. It recharges vital energy, helping to relieve lower back pain and digestive ills. Sit tall facing forward, feet flat on the floor. Exhaling, turn your entire trunk to face left. Anchor in your right buttock to keep the pelvis facing forward. When you have twisted as far as comfort allows, turn your head to look over your left shoulder. With each inhalation let your spine grow up from its base to the crown of your head. With exhalations, see if you can gently turn farther from the base of the spine. Come back to center on an inhalation. Rotate to the other side. Good posture is the essence of a young-looking body. Aligning the joints dissolves tension in the shoulders and lower back, allows your spine to find its full range of motion, promotes easier breathing and defines your figure, helping you look trimmer and more self-confident. Good posture also prevents neck problems, exercises the abdominal and pelvic muscles, protects your back as you lift and carry, and makes fitness workouts more effective. Poor posture can lead to backache and a stiff neck and shoulders, not to mention a stooped profile. Stiff areas aren�t used and so become stiffer, other body parts taking over to compensate, leading to imbalances and problems with flexibility and strength. Check your posture at regular intervals, perhaps when you stop at a red light or on the hourly news report. Stretch, shake out tension, and restack the vertebrae. On a chair, imagine your tailbone is dropping heavily onto the seat behind you. This helps bring your spine into neutral. Let the crown of your head float toward the ceiling; tuck the chin in slightly to keep the neck long. Visualize space between each vertebra. Sit cross-legged with your lower back touching a wall. Anchor your legs and buttocks to the floor. Inhaling, feel your spine grow out of your hips. Breathing out, draw your abdominal muscles back. On your next inhalation, rest both shoulder blades against the wall. Visualize the crown of your head growing taller. Choose an adjustable office chair. Move the seat until both feet are flat on the floor, legs hip-width apart, knees over ankles, backs of thighs well supported. Adjust the back of the seat to support your lower back with shoulders balanced over hips, ears aligned with the shoulders. Position the monitor so that you face forward. Keep elbows at right angles to upper arms, shoulders relaxed.